One hundred and eighty-nine Union veterans from Newark, New Jersey boarded a train in October 1883 heading for Richmond where they would attend a banquet with their former enemies in the Civil War. When I discovered a menu from this dinner, oddly printed on a Confederate banknote, I became curious about this unusual reunion in the former capital of the Confederacy. 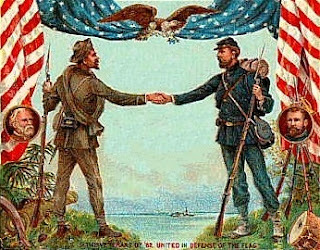 The long and complicated process of reestablishing cordial relations between the North and South went through various phases. In March 1865, with the war nearing its completion and the Confederacy in shambles, President Lincoln set the tone for reuniting the country in his second inaugural address, calling for “malice toward none...charity for all.” During the presidential race in 1868, Ulysses S. Grant advanced the idea of reconciliation with the campaign slogan “Let There Be Peace.” Nevertheless, it took almost twenty years before there was a growing awareness among veterans that there had been two sides in the conflict. In 1882, the Gettysburg Battlefield Memorial Association, which was responsible for erecting monuments and preserving the site, came to the conclusion that it was meaningless to mark the Union lines without knowing the Rebel positions. Accordingly, they invited former Confederate officers to visit the field and show them where they had been positioned. In another gesture of reconciliation that year, the Grand Army of the Republic (G.A.R. ), the largest national organization of Union veterans, marched together with Confederate veterans in a commemorative parade. 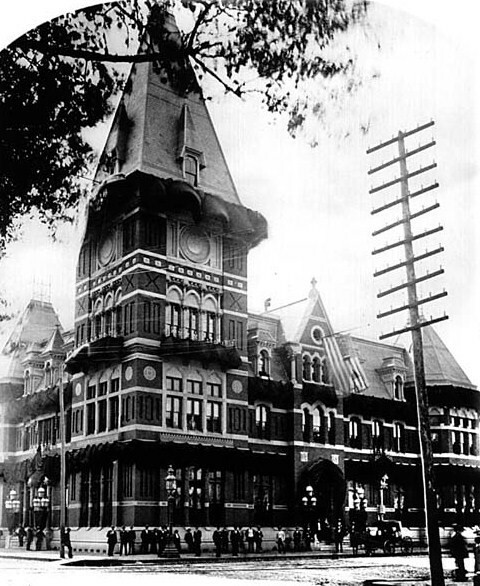 Early the next morning, the men hurriedly devoured breakfast at the Pennsylvania & Potomac station in Washington, so they would have enough time to walk over and see the small brass star that marked the spot where President James Garfield had been shot and mortally wounded two years earlier. In office for only two hundred days, Gardield was deeply mourned by those who remembered him as a beloved public servant and major general in the war. After the veterans paid their respects, they resumed their journey southward, stopping next at the battlefield at Fredericksburg. When they finally arrived at Richmond that day, they were greeted by the mayor and escorted to Ford’s Hotel on the corner of Broad and Eleventh Streets, facing Capitol Square. It was there, while checking in, that the veterans noticed there was no American flag flying over the hotel. As the men grew agitated, the proprietor quickly located a flag and hoisted it over his establishment, much to the satisfaction of his newly-arrived guests. With the matter settled, they finished checking in, passing the word to eat lightly in order to be ready for the banquet that evening. The $2 note below has a pink overprint and features a picture of Judah P. Benjamin, a lawyer from Louisiana who served as a Cabinet officer of the Confederate States. Since the back of this 1864 note was originally blank, it is easy to read the menu. Interestingly, the menus were also printed on denominations where the back was not blank. This $10 bill shows a unit of field artillery moving at full speed. Of the seventy-two different types of Confederate notes, it was the only one that depicted soldiers. Printing on Confederate currency may not have been as unique as it seemed, as shown by this bill advertising Ford’s Hotel. During their two-day stay, the Yankee visitors toured the tobacco warehouses, the Allan mansion in which Edgar Allan Poe had been “reared,” and St. John’s Church where Patrick Henry proclaimed, “Give me liberty or give me death.” They also walked around the former military prisons and battlefields looking for the small objects that were still scattered on the grounds. However, the veterans mostly visited the cemeteries that ringed the city, taking time to honor the dead of both sides, for the war had not stopped for these men when the shooting ended. They continued to live with their war. The veterans from New Jersey had grown disheartened by the time they were getting ready to depart. They had seen no national flags during their visit (other than the one flying over their hotel), nor had the citizens come out to cheer their parades. They felt they were not really welcome in the city. The mayor tried to convince them otherwise, explaining that it was not the local custom to display flags, nor was it part of southern etiquette to witness parades. Their commander also tried to reassure them, saying they would have surely won over the local people if they had had more time. Still, their perception was true. In contrast to the warm reception they received from their fellow veterans, the visitors had been shunned by much of the white population, representing about 58% of the 65,000 people who lived in Richmond. In the end, the Union veterans questioned whether their trip had accomplished much in bringing the country back together. Only time would tell. 1. Henry Benson, “Yank” and “Reb”; a history of a fraternal visit paid by Lincoln Post, No. 11, G. A. R., of Newark, N. J. to Robt. E. Lee Camp, No. 1, Confederate Veterans and Phil. Kearney Post No. 10, G. A. R. of Richmond, Va., October 15th, to October 18th, inclusive, Newark, New Jersey, 1884. 2. Thomas Edison began his career as an inventor in Newark before moving his home and laboratory to Menlo Park, twenty miles south of the city. After patenting a system for electricity distribution in 1880, he founded the Edison Illuminating Company, switching on its first generating station on September 4, 1882 to serve fifty-nine customers in lower Manhattan. 3. On the same day in October 1883, the Supreme Court ruled that the Civil Rights Act was unconstitutional. Signed into law by President Grant in 1875, the act guaranteed that everyone, regardless of race, color, or previous condition of servitude, was entitled to “the full and equal enjoyment” of public accommodations such as hotels, transportation, theaters, and other amusement places. It was rarely enforced, especially after the 1876 presidential election that resulted in the withdrawal of federal troops from the South, effectively ending the Reconstruction era. 4. Robert E. Lee Camp, No. 1, Confederate Veterans, was just getting started in 1883. Having met for the first time on April 18 of that year, the benevolent society was formed by veterans to aid their financially needy, often disabled, comrades. It was one of the first such veterans organizations formed in the South. 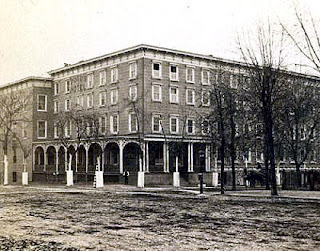 After incorporating in 1884, they opened a soldiers’ home on an old farm in the west end of Richmond (now the corner of Grove Avenue and the Boulevard) on January 1, 1885. 5. The Battle of Sayler’s Creek (now also known as Sailor's Creek) was fought on April 6, 1865, southwest of Petersburg, Virginia, three days before General Lee surrendered at Appomattox Court House. 6. New York Times, 1 June 1886. See Dry Monopole by Half a Length (11 April 2011) for another reference to the Memorial Day observances in New York City in 1886. What an amazing story and gorgeous menu... money, who knew? It seems a shame to let all that lovely engraving go to waste! Incredible narrative, Henry, wholly unexpected and inspiring. Veterans, above all, know the costs of war and most cherish peace. My 2x's great uncle Frank P. Mulcahy was the commander of the 11th Lincoln Newark NJ GAR Post at the time of this trip. Thank you for this article...it's wonderful reading about something a relative was part of.